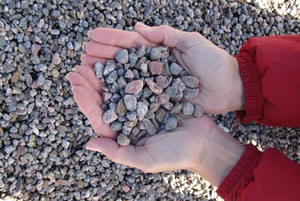 Our aggregate products are available in bags, totes and bulk delivery to your home, cottage or place of business. 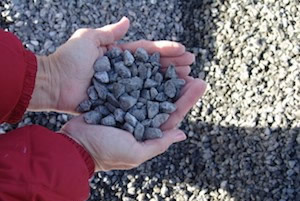 Used for pathways, driveways, precast. Is esthetically pleasing but will not compact. Not recommended for hills. 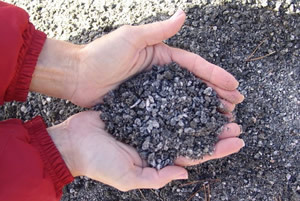 A premium asphalt aggregate for surface course paving. This product is also popular for pathways and drive-ways and is often used as a decorative ground cover. 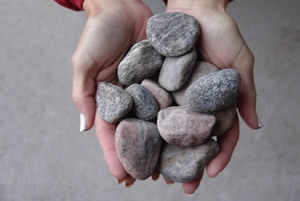 Uses include as decorative stone in landscaping, drainage stone around basements and for septic weepers. It is not recommended for driveways. 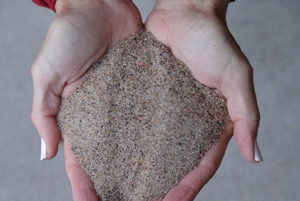 Manufactured sand produced from crushed granite. Packs very well when suitably compacted. 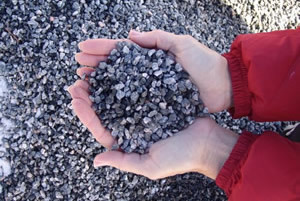 It is an attractive surfacing material on pathways and driveways and is also used under pavers or inter-locking brick. Not recommended for use on slopes where it can be washed away. 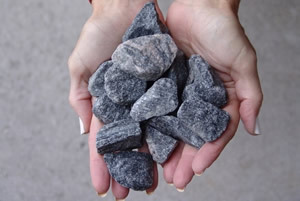 A small (3/8”) washed round stone used for pathways or driveways and as a decorative groundcover in landscaping. It does not compact and is sometimes used in playgrounds. Also used as a roofing stone. 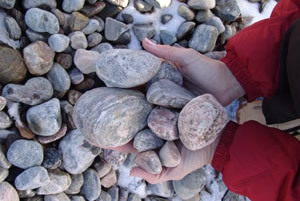 A medium sized, washed round river stone used primarily as a drainage stone or as a decorative ground cover. Also suitable as a roofing stone. 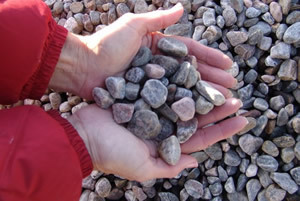 A somewhat larger sized (3/4” to 1 1⁄4”) washed round river stone suitable for drainage stone applications and in septic beds. It is also popular as a decorative landscaping ground cover. Too large to be used for pathways or driveways. 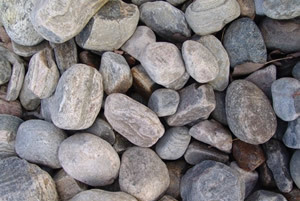 A washed round river stone used in landscaping applications as a decorative groundcover or in ponds. 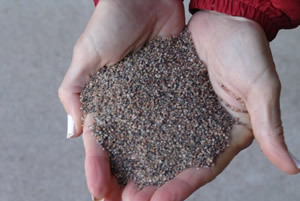 Our CSA compliant granite playground sand is the top choice for playgrounds both locally and across North America. It is an exceptional protective surfacing material created with the safety of children in mind. Our sand has continued to meet and exceed the CSA standards in dry, wet or frozen environmental conditions, without requiring rototilling. 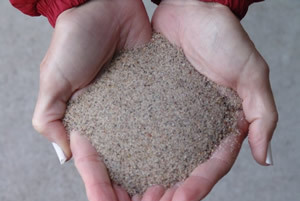 If you want the softest, cleanest, and safest sand on the market, this is your product. This product is ideal for use to bind blocks, bricks or parging (a process used to enhance the look of a structure). It is a multi-purpose mortar. Mortar becomes hard after it has been set. It can also be used to fix, or repoint masonry when the original mortar has been washed away. Additionally, mortar is very effective as a sealing agent when constructing a waterproof wall. Natural Traction Sand that provides superior traction on ice and in snow. Where safety is a concern, our sand truly makes the difference in the most challenging winter conditions. This toxic-free product provides instant traction during any snow or ice storms, including freezing rain. Ad-ditionally, since our product is washed, cleaned and dried, it contains no fine sand, silt or clay and will not turn into mud. For this reason it is less likely to track indoors or cause a mess! The traction sand is hard and durable. It embeds itself into ice and snow for long lasting, reliable traction. And finally, our traction sand will work in any temperature, unlike salt and ice melters that fail to be effective when the temperature drops.